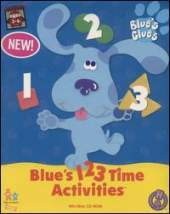 Devoted to teaching kids ages 3 to 6 early math and thinking skills, this features the characters from the popular preschool television show Blue's Clues. There's a big backyard fair, and emcee Steve greets players in his inimitable fashion. The game is a series of mini-games tied together with the backyard fair theme, each geared toward teaching match and logic skills while it entertains. A breakdown of the mini-games: Baby Bear's Card Game. Players try to be the first to get rid of all their cards. This is a variation of Go Fish - players match shapes and quantities; Bell's Souvenir Stand. Players weigh souvenirs to fill requests; Felt Friend's Pattern Parade. Players help decorate floats by completing patterns; Shovel and Pail's Mother May I? Game. Uses a simple number line to help kids count and add; Mr. Salt and Mrs. Pepper's Snack Stand. Kids sort food items according to their attributes; In Tink's Train Ride, players help Tink build his train while learning about adding and subtracting items in the bins; Cash Register's Prize Tent is the place to redeem Blue Dollars that have been earned from playing the other activities. Use Blue Dollars to earn a Big Prize. There are 9 parts needed to assemble each Big Prize.